At the Montclair Learning center, our goal is to provide an enjoyable learning environment for your children. According to research by Cambridge University, fun is a key component for learning and memory. We have created programs that will excite and enrich your children. The experience will open their mind up to the endless possibilities offered by STEM, with practical applications that will empower them to utilize those knowledge in the real world. 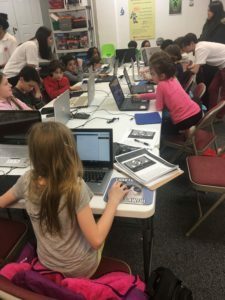 We live in a digital world and STEM empowers children to understand how things work, allowing them to developer lifelong skills like problem solving, teamwork, Analytical skills. Research shows that “by the time students reach fourth grade, a third of boys and girls have lost an interest in science. By eighth grade, almost 50 percent have lost interest or deemed it irrelevant to their education or future plans. At this point in the K–12 system, the STEM pipeline has narrowed to half. That means millions of students have tuned out or lack the confidence to believe they can do science”. In addition to educational courses, we provide exciting ways for your kids to get involved. 1.Have a STEM Birthday party. Forget the conventional birthday parties. We offer a wide array of fun activities for your kids and their age group. From making lava lamps to creating their own 3D video games. We even offer themes such as Harry Potter or Star Wars. Your child and their friends can even build their on robots or become CSI detectives. The possibilities are endless and the memories they create with their friends will be priceless. Socializing and being introduced to new concepts are the best way for your kids to grow new neurons that will inspire their creativity and happiness. Social skills are important for children as they provide ability for conflict resolution, forming positive social interactions, being open to other people’s ideas and taking responsibility for their actions. Being around a diverse population and ideas will enable them to see the world in a different perspective. Having the ability to be objective will allow them to make better decisions, process information faster and excel in more activities that are important to their continuous growth. Learning happens when they actually do and apply their knowledge in the real world. Curriculum created by the Montclair Learning Center STEM course include science experiments, Legos, magnets and electric circuits. We have done extensive research and hire only the most qualified STEM teachers that will properly apply the STEM learning method that will help your kids retain and use their learnings in a lab environment. Our summer camp is located at the Bloomfield Presbyterian Church at 147 Broad St in Bloomfield (about one mile from our current location). Whether you have a 3 year old that is adventures and asks “why” about everything or a 6-grader than challenges the “why” given to them, we offer a fun and exciting environment for a summer they will never forget. These courses will prepare and complement their next level of education. We will tailor the program to their interests and educational necessity . We offer Minecraft competitions, it’s no secret kids love challenging each others, and competition is one of the most thrilling way to learn. The excitement of winning a prize will give them positive reinforcements for achievements and will build a mindset of that will enable them to achieve their highest potential, while still having fun! Definitely one of the best way to passively build self confidence for your children. With our busy lives, sometimes it can become hard to find quality family time. It’s always on the top of your mind but with work, errands, and fast paced world of our generation, finding time to do quality and memory building activities end up in the back burner. Build Legos with your kids, look at the sky at night to watch the moon and stars, observe animals and plants when you go to the park, practice additions when you shop or fractions when you cook. At the Montclair Learning Center, you can be at peace that when you are here, we will provide a wide array of activities that will entice every member of the family. Family time spent will strengthen your bond and create lasting memories.